After serving two years in the Peace Corps in Niger, Africa (1966-68) Irola returned to San Francisco where she went to work for KQED-TV in their documentary film unit. She worked as a cinematographer for over 30 years and her films have won numerous awards. Her first feature Northern Lights won the Camera d’Or prize at the Cannes Film Festival in 1979. In 1993 An Ambush of Ghosts garnered her the Cinematography Award, Dramatic Competition, at the Sundance Film Festival. 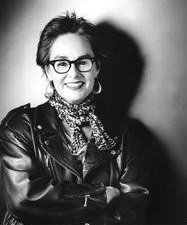 She has photographed 17 independent feature films, including Working Girls by Lizzie Borden and The Dead End Kids by JoAnne Akalaitis. Her numerous documentary credits include: THE GLAMOROUS DAYS OF THE ADLON HOTEL, (First Prize Bavarian Film Festival) directed by Percy Adlon; THE MAN WHO TRIED TO BUY HOLLYWOOD: Giancarlo Parretti, (First Prize Venice Film Festival) directed by Jean-Pierre Moscardo; and SATURDAY NIGHT LIVE, eight films for SCHILLER’S REEL, including LA DOLCE GILDA. She has shot documentaries in Brazil, Grenada, Mexico, Jamaica, Cuba, the Soviet Union, France, Denmark, Italy, England, Poland, Mozambique, Kenya, and throughout the United States. Love my dogs. Oops. After most of my life as a cinematographer I decided to make a trilogy of my life as a director. The films are on YouTube and have been very successful. I listen. Teaching cinematography is highly technical and the students are shy about asking questions they feel are “stupid.” I can feel their anxiety and prompt them to come forward. I also make a mean putanesca and have grad students for dinner every semester so they can really open up. By being open to change. Not only new technologies in filmmaking but also personally. This is easier said than done! Personal: Accept aging and grow older with grace. Business: Hope my films continue to be well liked. Passion. In one’s work and personally. Strive to be the best and accept defeat once in a while! Stand up and start all over again. I’ve never accepted that I’m a second-class person in an all-male field. I’m just as good (well maybe better!) than my male colleagues and they accept me as an equal. Men are actually a lot of fun and not the enemy. Be good to yourself and all around you. Accept everyone for who they are.